Update 6-16-2011: The Oz-Post Fence Brackets have arrived and they're going fast! Update 5-18-2011: Due to a shipping delay, the brackets will not arrive until mid to late June. Good News. We will have the large and small Oz-Brackets back in stock on, or around, May 15, 2011. We are now accepting pre-orders on our website. The brackets are very popular, and we can't guarantee how long our stock will last, so order soon. *You can cancel at any time before the date of shipment without being charged. There is a growing trend in fence construction with the use of steel posts for wood fencing. This new trend is in response to the problem of sub-terrain rot and insect damage on traditional wooden posts. Many people enjoy the warm natural look of a wooden fence but would like it to last longer then 5-10 years. Above ground level many wood species will last a very long time with no significant maintenance. The problem with wood fence posts is at ground level excess moisture and insects thrive and the post weakens and the fence becomes unstable. The easiest and most effective way to solve this problem is to use galvanized steel posts instead of wood posts for your wood fence. The IS-FBS is an easy to use bracket that provides an excellent steel to wood connection. This bracket is designed for use with standard 2 ⅜" OD steel tubing and includes all necessary hardware to attach it to the steel post and to the wood rail. One of the advantages of the Oz-Post bracket is that you can clip them on in the general location where you want them and then fine tune the location by sliding them up and down the post before you attach them with the self drilling screw. The IS-FBS uses a secure connection and does not rely on compression attachment like other inferior options. The IS-FBL, large fence bracket has large steel tabs that provide an easy way to create a wood facade around the steel post, creating the look of using 6x6 posts. 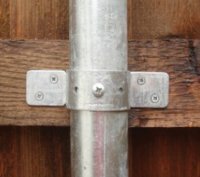 The IS-FBS, small fence bracket provides a standard steel post look.